2018 Ford Mustang Review: It's a Pony? No! It's a Wild Horse! 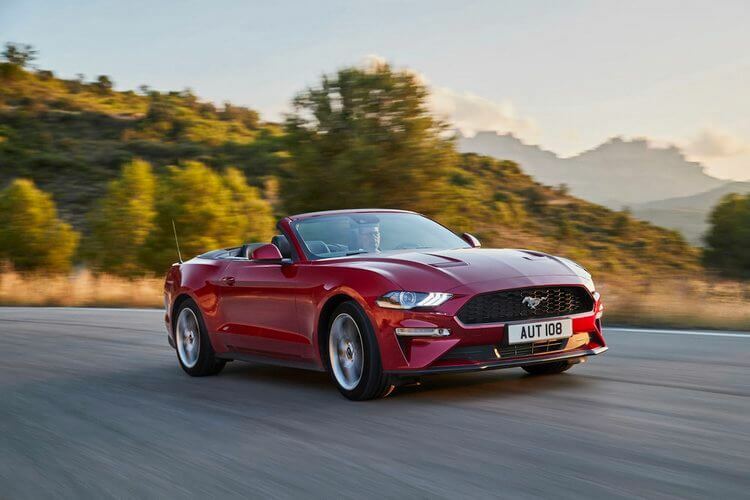 Home » Automobiles-Cars » 2018 Ford Mustang Review: Is It a Pony? No! It’s a Wild Horse! The wild horse of America – Ford Mustang has always been a prominent competitor in pony car market, alongside with Chevrolet Camaro and the Dodge Challenger. Of course, this 50-year-old pony car generation always has to innovate itself constantly if it wants to keep up with the today’s generations. So, what news does the 2018 Ford Mustang bring this time? Let’s check it out! 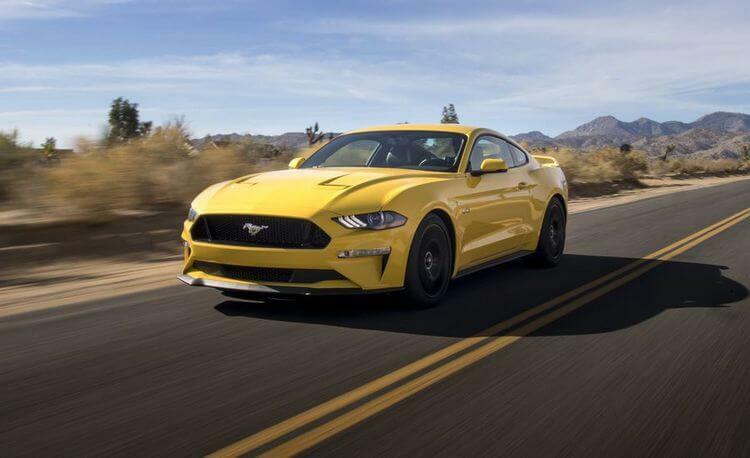 Ever since the very first recognized “pony car” – Ford Mustang released in 1965, it has become an important segment in muscle car market, especially for the younger customers. Soon this pony car segment became so successful that other competitors quickly jumped into the “fray” like Plymouth, Chevrolet Camaro, and AMC Javelin. However, during early 1970s, customers gradually shifted their interest to something faster, more… luxurious. Therefore, Ford and other competitors had a hard time to push the pony car segment further. 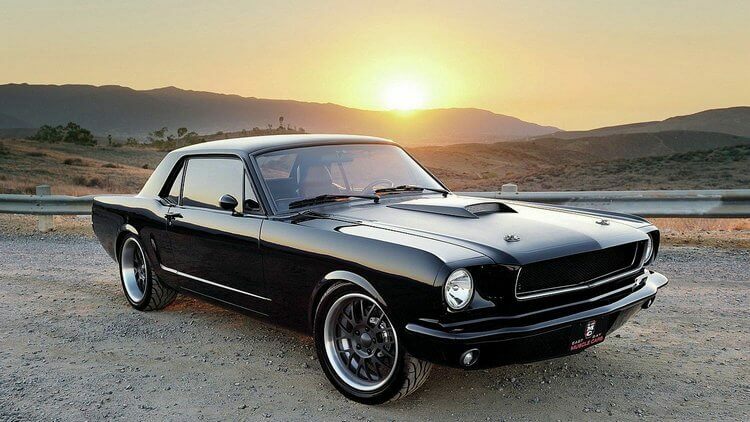 But as we know, Ford Mustang has become as powerful as ever and kept innovating itself throughout 6 generations. Despite being successful in its own right, the 6th generation still has to compete with other heavy contenders, typically Chevrolet Camaro and the Dodge Challenger. 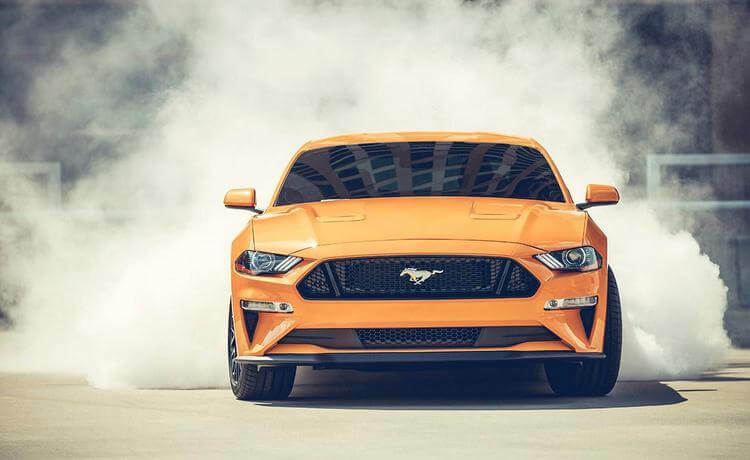 So what has Ford done to the latest 2018 Ford Mustang to surpass those 2 prominent competitors? 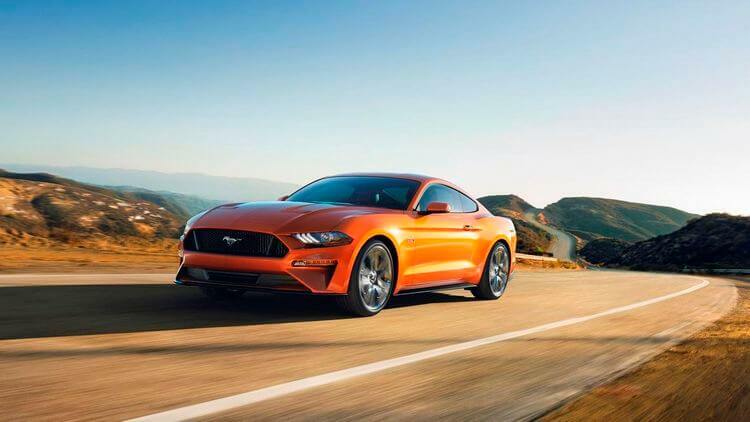 Well, the 2018 Ford Mustang got an all-round upgrades, notably the V-8 engine, new 10-speed automatic gearbox, the Mustang’s Performance Package, and the famous Ford’s MagneRide adaptive suspension. But how do these upgrades enhance the Ford Mustang experience exactly? Let’s find out! 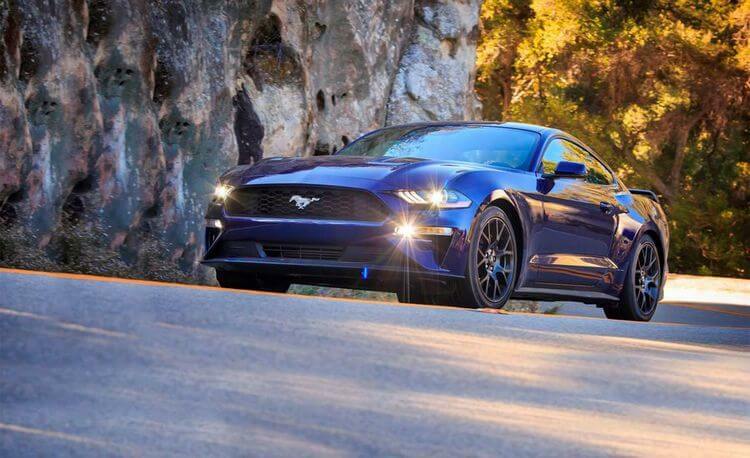 In overall, the 2018 Ford Mustang still maintains its iconic shape, with a number of changes. Many people may find its appearance design quite… ugly but personally we feel it to be suitable for a powerful Mustang. But of course this depends on different people’s sense of beauty so let’s leave it for each of us to decide for ourselves. From the front, we can see it has a new sheet-metal which provides a sharper and lower front end, which feels more modern. Next, it includes new LED headlights and new bonnet which features extra air vents. The rear is also revamped and it looks quite cool in terms of modern aesthetic (but it still retains the look of a true Mustang), including LED taillights and the rear fascia. The trunk is decent and somewhat spacious; however, we still do not recommend it for heavy package. 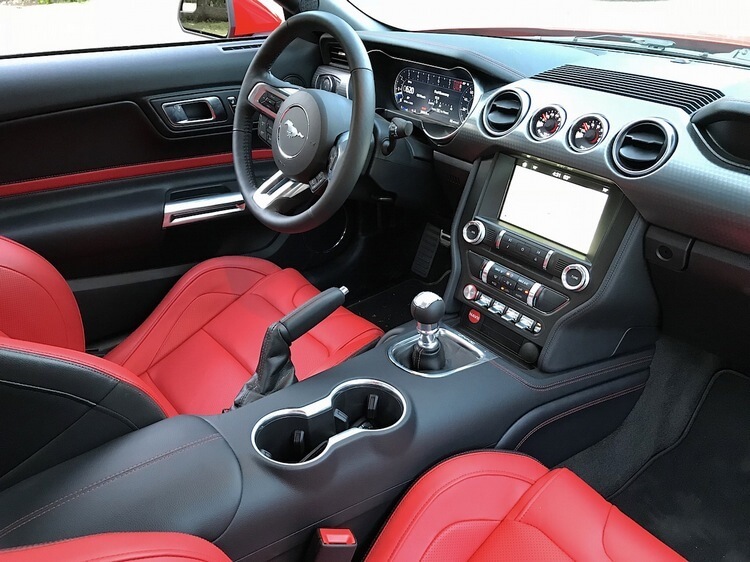 Coming inside 2018 Ford Mustang’s interior, we still see the similar design, but again, with several changes to small details such as soft-touch upper door panels, padded knee bolsters, and the heated steering wheel (if we are so desired). Customers can select between standard seats, which feel really squishy and comfortable, or the high-backed racing seats (but most of the time we definitely prefer the standard more). With all that said, the real MVP here is the new 12.4-inch digital instrument cluster which replaces the traditional gauges. It is really easy to navigate and it smoothly changes between modes. In Normal mode, we still see the standard display. But after changing to Sport+, the tachometer will shift the top of the screen. And in Track and Drag modes, the display will show a large, practical tachometer which changes colors to highlight the shift points. 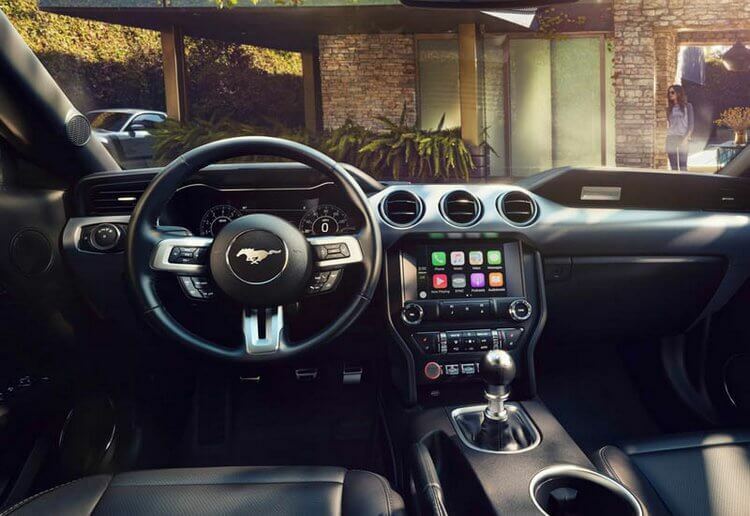 Probably the only complain about 2018 Ford Mustang’s interior is its unpolished design in terms of fit and finish like the visible cheap plastic or the bothersome buttons with chrome effect. Even in Premium version, we can see the hard plastic for the lower parts. While these do not affect the performance in overall, they still give us quite a bad first impression. On the other hand, the rear seats are still atrocious even for the children, but we expected no less (at the very least, it is suitable for light packing). Some may also report that the seat space is rather small and uncomfortable; however, we did not sense the same problem in our case. As usual, this year’s Ford Mustang provides quite a number of choices, including personal customizations and technological enhancement packs. In general, we have 2 following options: coupe or convertible, and, the turbocharged 2.3-litre EcoBoost or the 5.0 litre V-8 engine. As always, the Mustang still features the 6-speed manual transmission. In case of the V-8, the 6-speed manual transmission also gets a dual-mass flywheel and twin-disc clutch. It still feels as amazing as ever: smooth gearbox, stiff suspension, responsive brakes, and sticking-to-the-road tires. But in case you are looking for something new, the optional 10-speed automatic can be a nice change-of-heart. Its shifts are undoubtedly fast and impressively responsive in Sport mode. Also, it provides incredible sense of control and precise gear around corners. On the other hand, the turbocharged 2.3-litre EcoBoost no doubt sounds lackluster compared to the V-8. But that does not mean it lacks passion. 310 horsepower and 350 lb-ft of torque is definitely not a joke, especially if we consider a Ford Mustang GT roughly 8 years ago. Interesting enough, the 10-speed automatic actually seems to work wonder here than the V-8 by providing smart shift logic and maximum fuel economy. In terms of sound, The V-8 definitely sounds deep and powerful (probably you want to use during 6 A.M unless you like to “tease” the neighborhood). And talking about sound, Ford also includes an optional active exhaust system (around $895) which features four settings. In Quiet mode, the exhaust has its rhyme but you will probably hear the engine upfront more than from behind. From Normal to Track mode, the sounds will get louder, deeper, and more powerful (and maybe annoying depending on our personal taste). And if you don’t want to get into trouble, you may want to that Quiet Start feature. 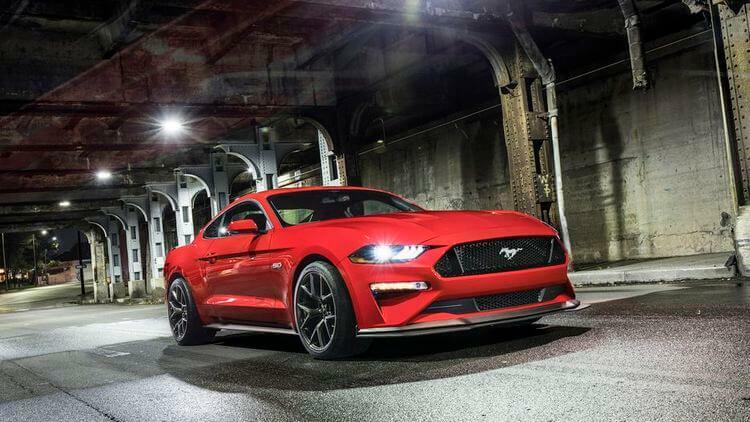 To boost 2018 Ford Mustang’s performance to the max, Ford has provided 2 major enhancements: The Mustang’s Performance Package and the MagneRide adaptive damping suspension. 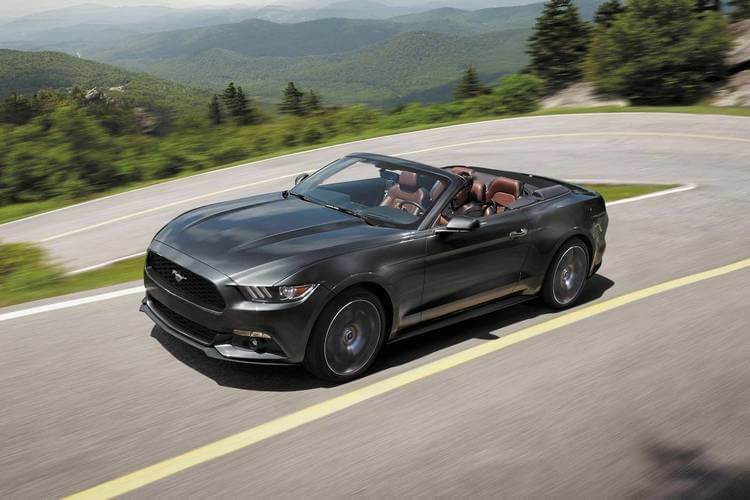 First, the Mustang’s Performance Package ($3995) really pushes the Mustang’s experience like that of a sports car. The package includes variety of enhancements, namely the heavy-duty front springs, Torsen limited-slip differential, upgraded Brembo brakes, new wet-and-dry Michelin performance tires, and some other chassis upgrades. And second, the MagneRide adaptive damping suspension ($1695) which is available on Performance Pack works wonderfully. This feature was originally applied for the Mustang Shelby GT350. And as the matter of fact, it is perfect with the 2018 Ford Mustang. From Normal to Track mode, it optimizes the sensitivity and damping forces to the wheel motion. While in Drag mode, it softens the shocks from rear side relatively to the fronts, providing much more effective transfer in Mustang’s weight. Overall, both the Performance Package and MagneRide dampers provide the 2018 Ford Mustang an even more agility and responsiveness. Drivers can feel the control of its entire body with firm and responsive brakes. It maintains a wonderful driving experience while travelling on streets or even fast travel on mountain roads. Steering can be heavy, but nonetheless, it is a muscle car, a wild horse and if we know to handle it, we will be surprised. Of course as good as it may sound, certain customers will still concern about the safety element. Unfortunately, Ford also offers a set of optional active safety features including lane departure warning, distance alert, pedestrian detection, and the Pre-Collision Assist system. All are optional and even if we include them, they still work nicely and do not affect our overall experience. To summary, 2018 Ford Mustang is indeed a powerful pony/muscle car, a wild horse. It can provide great riding experience, depending on your needs. If you are looking for a loud, powerful ride, the 5.0-litre V-8 coupe will be your best bet. Or, if you want something practical and suitable for daily use, the 2.3-litre Ecoboost should be suitable. And so, it leads us to a question: Should we choose 2018 Ford Mustang over Chevrolet Camaro? 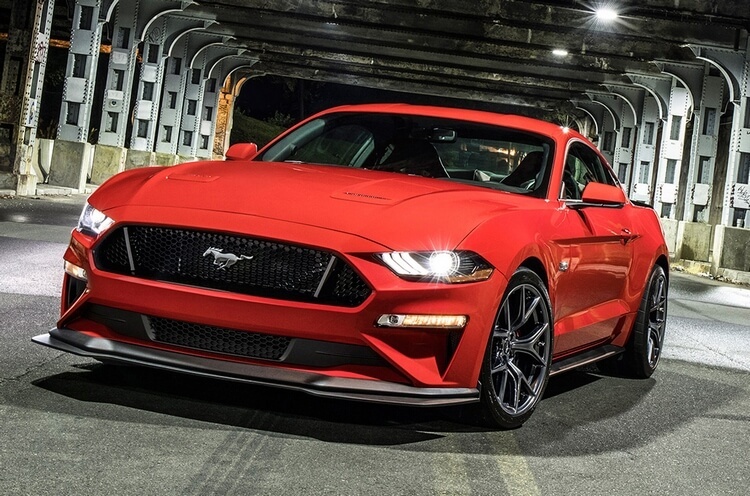 Well… yes and no… The thing is: 2018 Ford Mustang does feel good, provided that we have additional packages like the Mustang’s Performance Package and MagneRide dampers (which can be pricey for some). These two enhancement packages provide a huge different between a Mustang including them and the one without them. Considering the Mustang’s base price: EcoBoost – $26,485; EcoBoost convertible – $31,985; GT – $35,995; GT convertible – $45,495; the Chevrolet Camaro stills seems to be in upper hand. But if you are willing to give 2018 Ford Mustang a chance, surely it will not be a disappointment. And that’s it folks! What do you think about 2018 Ford Mustang? Feel free to share with us and for now, thank you and stay tune for more news in the future!